The Million Dollar Seed: How to Write Your Book and Build An Empire accelerates writers and authors into being authorpreneurs with the speed of light! As the Book Writing and Marketing Acceleration Coach, Mentor and Author, Stella Togo offers a wealth of insider secrets and prosperous marketing strategies including “The 9 Steps to Plant Your Million Dollar Seed” before you begin to write your book. With her new paradigm and accelerated systems, Stella shows you how to create a minimum of 25 topic titles and headings within your content that can also be used for eBooks, speaking engagements, teleseminars, blogs, and much more! As an added bonus and true testament to her established credence, Stella shares success stories about her clients who are building their empires. WHY JUST WRITE A BOOK WHEN YOU CAN GROW A BUSINESS? Diagnosed with breast cancer at age 32, Crawley is a cancer survivor who insightfully and effectively eases a woman’s fear by helping her honor the divine spirit within. Highly recommended by Jack Canfield, editor of the bestselling Chicken Soup for the Soul series, women who fear, have, or know someone with breast cancer will experience this book as if having a heart-to-heart with a best friend. 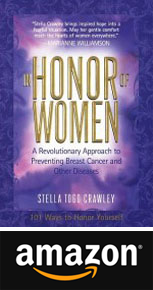 Crawley leads with 101 Ways to Honor Yourself as a Woman, reminding women to do self-indulgent activities such as receiving a professional massage or treating themselves to a pedicure. She insists on the necessity of living life as a receiver and not just a giver, establishing a new women’s movement called the Honor Movement. Readers will also find detailed suggestions on creating a 10-step healing plan, ways to support someone recovering from breast cancer, and clearly illustrated positions for giving themselves a visual breast inspection. This take-charge book offers new perspectives into illness and disease prevention, but is cozy enough to join you and a cup of your favorite herbal tea.